... a second-hand bookshop located in the centre of Stratford upon Avon, birthplace of William Shakespeare. We stock second-hand, rare and antiquarian books covering a wide range of subject matter; fiction and non fiction, old and new. Whether you are looking for an inexpensive holiday read or a very special present it is well worth while paying us a visit. 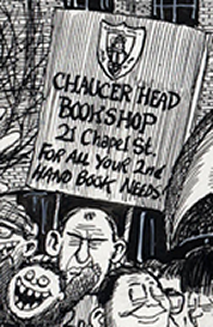 For an idea of the breadth and range of our stock, visit our on-line listings at www.chaucerheadbookshop.co.uk, where you can browse our book catalogues by subject area or search for specific books by author or title. You can also buy the listed books - we usually ship daily (Monday to Friday), using Royal Mail First Class for domestic deliveries and the Royal Mail Standard International service for overseas customers. 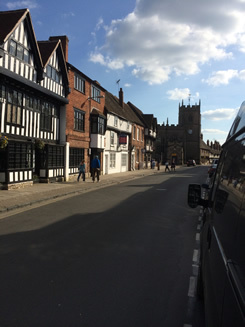 We are located at 21, Chapel Street, Stratford upon Avon, CV37 6EP. In due course we will put more detailed information about the best way to get here, public transport (ha!) and parking (double ha!). In the meantime, Stratford on Avon railway station is a ten minute walk away, keep going towards the town centre until you get to the roundabout by Barclay's Bank, then turn right along the High Street. Chapel Street is straight on, in the next block. If arriving by bus the town centre stops are in Wood Street and Bridge Street. These streets are linked by the roundabout by Barclay's - once again turn onto the High Street and follow your nose.